You may have noticed over the past couple of years that the price of oil has been absolutely hammered, but you’d be surprised to know that the loss has more to do with politics than market fundamentals. The fall in the oil price has been nothing short of absolutely astonishing, with the West Texas Intermediate price going from over $100 a barrel in August of 2014 to lows of below $30/bbl recently. In fact, it’s been widely reported that oil got to a point recently where it actually cost less than the actual barrel. It’s somewhat ironic that the downfall of oil, particularly in the US, can be traced back to its resurgence. 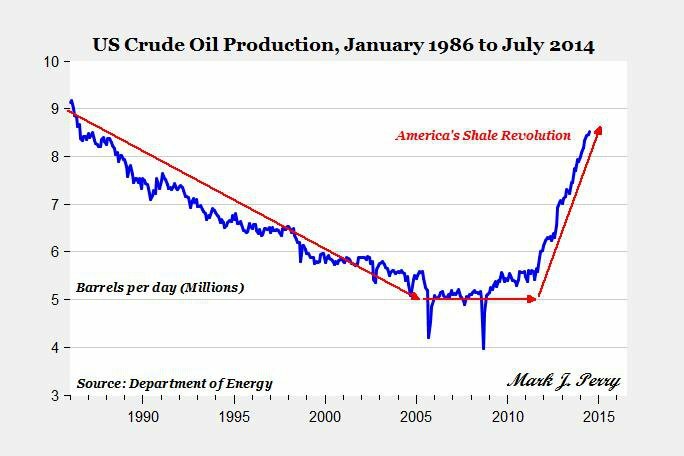 You’ve probably read a bit about the ‘shale gale’ in the US, or how the US was able to turn around flagging oil production via the adoption of hydraulic fracturing or ‘fracking’. 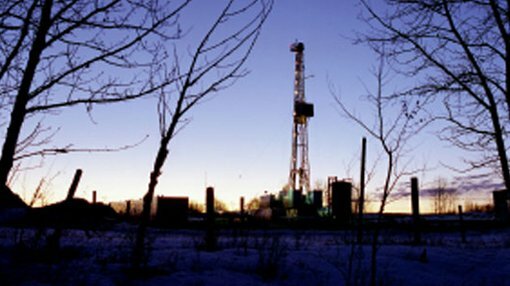 While fracking itself is not a new technology, when combined with horizontal drilling (which is a relatively new proposition), it was opened up for wider adoption. The cost efficiencies had gotten to a point where new oil-bearing horizons which couldn’t be tapped before because they were too ‘tight’ could be tapped. The chart below from The American Enterprise Institute shows just how the new application of technology took the field by storm. As you can see from the above, US crude oil production was in decline with older conventional fields starting to run dry. That is, until about 2012-13 when hydraulic fracturing started to open up new horizons. Suddenly, the US had become somewhat of an energy powerhouse in its own right. In 2005, the share of imported oil against the oil consumed in the US had reached about 60% in light of declining domestic product. It was a net oil producer. However, by 2012 when the revolution was really just kicking off it reached 42% according to Energy Information Administration numbers. That ratio only grew tighter. All of a sudden, the US was pumping the crude and finding it could sustain itself largely on its own oil. Whatever the environmental consequences of the shale gale, it had effectively disrupted oil markets around the world by making the US a market which bought less oil from overseas. Around October of 2014, the Organisation of Petroleum Exporting Countries (OPEC) was looking at the North American shale gas revolution with revulsion. OPEC is a coalition of 12 petroleum exporting countries, led by the likes of Saudi Arabia, Nigeria, and Qatar. It gets together to set production quotas for those 12 nations, which control the lion’s share of world production. A production cut sends prices higher because there’s less supply, and an increase sends prices lower because there’s a glut of oil on the market. About mid-way through 2014, rumblings were rife that OPEC would do nothing to arrest a looming oversupply on the world oil market. The US was importing less because it was producing at home, so the OPEC oil was finding its way to other markets and there was already downward pressure on the international oil price. OPEC is hoping that the US producers will blink and choke back oil production, and prices would start heading toward $100 per barrel again. However, this hasn’t happened yet — testing the resolve of OPEC nations such as Venezuela. US producers, while some have gone bust, have proven to be resilient simply shutting in production and not engaging in new exploration. They’re simply idling until somebody blinks, and the oil price will remain low until a circuit breaker can be found. While it’s a fairly good outcome for the people or Iran, the freezing of sanctions against Tehran from the west recently hasn’t exactly done a massive amount to provide an uplift in the oil price. Earlier this month, economic sanctions against Iran levelled by the EU and the US were lifted. They were placed there in the first place over Iran’s nuclear energy program with the West insisting that the nuclear material being produced in the country was for nuclear weapons while Iran insisted that it was for nuclear power generation. While sanctions have been ongoing in one form or another since 1979, the latest round really started back in 2006 when the UN slapped sanctions on Iran. A little while later, the US targeted investors in Iran’s oil and gas sector. However, as of earlier this month a lot of those sanctions have been lifted. While hailed as a progressive move to restore some relations between Iran and the west, it hasn’t exactly helped the oil price. According to OPEC, Iran has production of about 3.1 million barrels of oil per day, but some estimates have it at twice this. Whatever the case, it’s a heck of a lot of oil to be coming onto the market. Iran had effectively been getting around the sanctions by getting nations such as India to pay for Iranian oil with gold, but the lifting of sanctions means that it’s now free and open to explore other markets. Debate has been going back and forth about how much extra Iranian oil will make it onto markets, but even more supply is hardly going to be a positive. The prospect of the oil and gas price going back up largely comes down to who blinks first in the war between OPEC and the US.